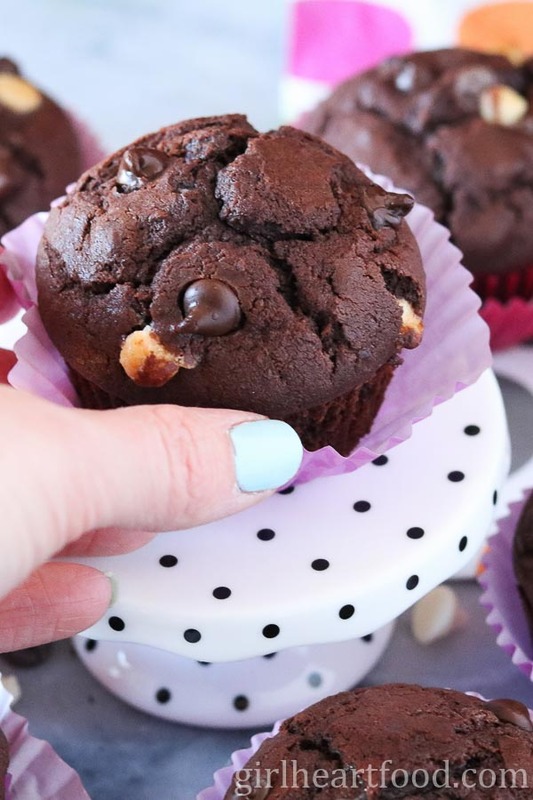 Made with cocoa powder, milk and white chocolate chips, these Triple Chocolate Muffins are fluffy, ultra chocolatey and a delicious way to kick off the week! Hey everyone! Starting the week off right….with CHOCOLATE! Ok, I know that most people want to eat a little healthier after the weekend, but don’t ya think we should ease ourselves into it? I mean, what’s the rush, am I right? Jokes aside, these are really good muffins. One of these fresh out of the oven with a cuppa coffee or tall glass of milk makes me happy! From this chocolate muffins, I used my stand mixer. If you don’t have one, a hand mixer will do the trick just as well! I organized our pantry this weekend and I can actually see the stuff we have there. Don’t you just love spring cleaning? Or is it just me? I have to be in the mood to do it, though. But when I am? Watch out! The trick now is to actually keep it organized. The struggle is real. I discovered a whole bunch of chocolate chips – mini, regular, all sorts of flavours. I was like a kid in a candy shop right in my own home. Oh, the little things. Do you know the key to getting that chocolatey top with muffins? Reserving a few chocolate chips and dabbling into the tops before baking! Voila – they’re literally bursting with chocolate! Plus, it just adds a lil’ somethin’ somethin’ to the finished product. 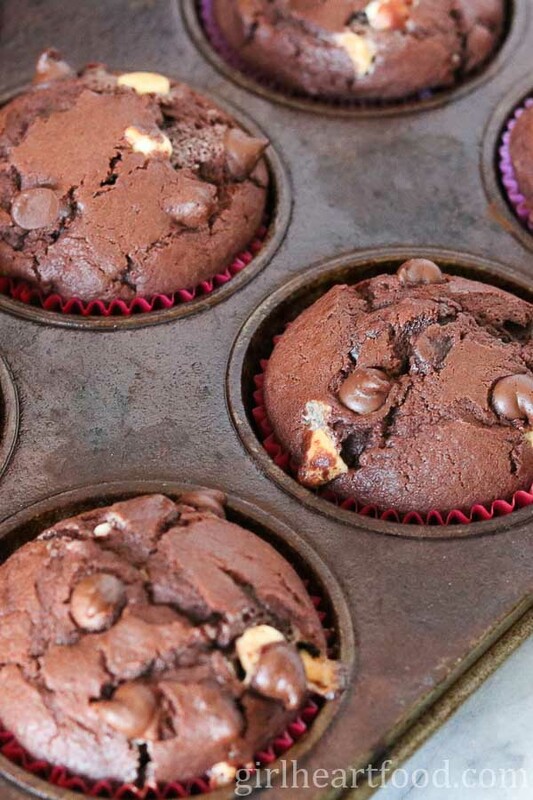 Hope you love these Triple Chocolate Muffins as much as I do! Don’t forget to subscribe below to stay in the loop on all the latest recipes. 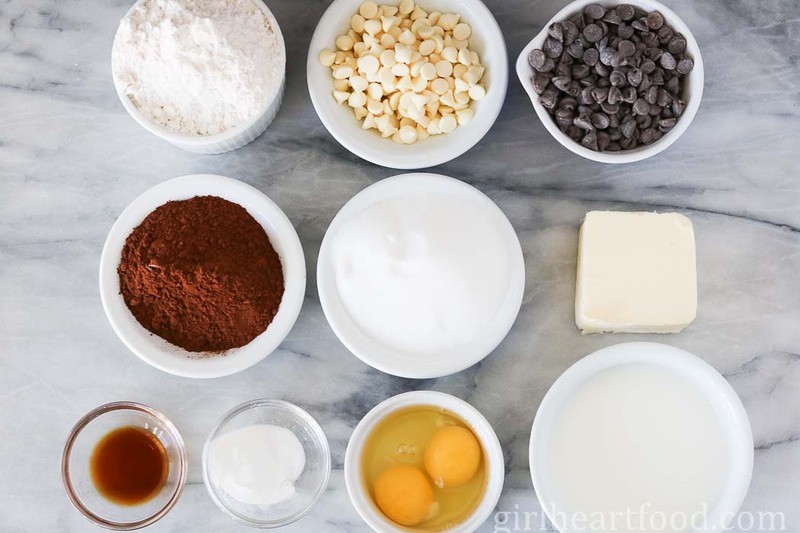 In a bowl combine flour, cocoa powder, baking powder, and salt. Stir to combine and lay to one side. Prepare muffin pan - grease mufin liners to Pam and lay to one side. Preheat oven to 400F. In a stand mixer or bowl (and using hand mixer) combine sugar and butter. Mix on medium until combined and creamy, about 1-2 minutes. Add vanilla. Add eggs, one at a time, until just combined. Alternating between flour mixture and milk, add to mixer and stir to just combine. Stir in milk and white chocolate chips and mix about 1 minute until combined. 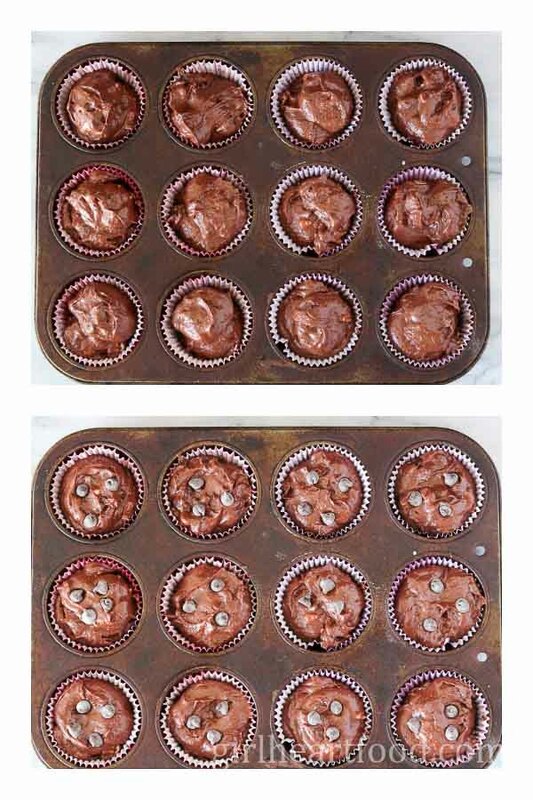 Distribute mixture among muffin liners and top each muffin with 3-4 chocolate chips. Bake for 18 minutes or until wooden skewer inserted comes out clean. Let cool in muffin pan for about 10 minutes before removing. Enjoy! 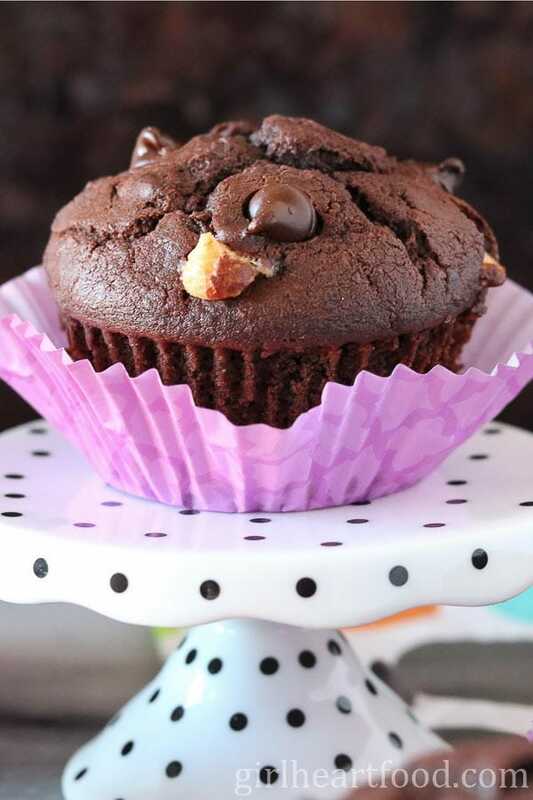 I love all of the chocolate in these muffins! Perfection! You got me at triple chocolate, Dawn 🙂 Love a good spring clean, so therapeutic especially when you come across delicious treats like chocolate chips. It’s the little things in life, right? Have a wonderful Easter Holiday weekend. I need to get going on spring cleaning. An organized pantry does make me happy. These muffins look scrumptious, Dawn! I’m transfixed on the gooey pieces of chocolate! Yummy!! These look SO good! I don’t have to let them cool, do I? Because I don’t think I could wait 10 minutes! Haha…I suppose not 😉 Thanks Kevin! First, I love that cake stand! Second, I love these chocolate muffins! Third, I love these chocolate muffins on that cake stand! 🙂 These look super chocolaty and moist and delicious! 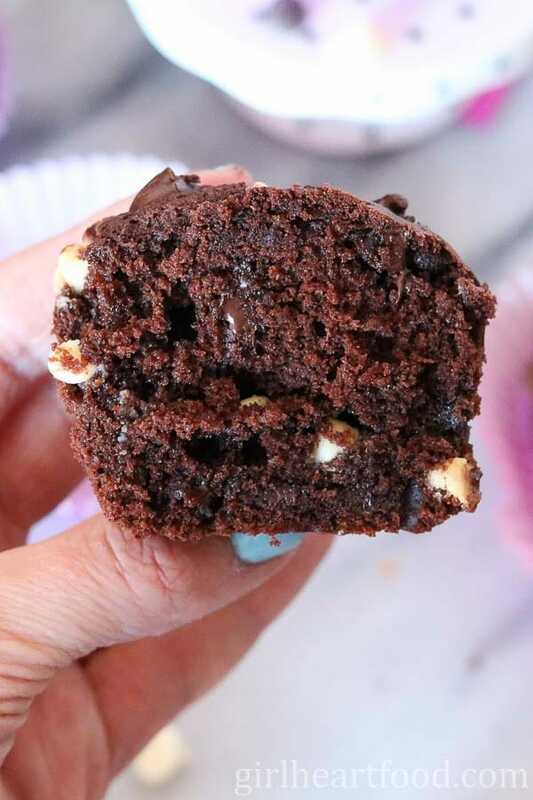 I love when the word “triple” goes together with “chocolate”; that’s a very delightful combination 🙂 I love these muffins too – they’ve got a beautiful fudgy texture. You know how to start the week off right Dawn!! I haven’t made chocolate muffins in such a long time, but after reading your recipe, I definitely need to put these on the baking list soon! My hubby would love them for breakfast with his morning coffee! Haha- can never go wrong with chocolate 😉 Thanks Leanne! Hope you guys enjoy! The more chocolate, the better 😉 Thanks Sarah! I’m imagining these warm with a scoop of vanilla ice cream. My mouth is totally watering right now. Pinning this to make with my kiddos. Those look like festive muffins. So pretty and love all of the chocolate in so many ways. Thanks for the recipe! Thank you so much, Ginny 🙂 Have a great week! I am 100% okay with starting the week off with chocolate. Thanks for this yummy recipe! Glad I’m not the only one 😉 Thanks Katie! These look amazing! So gooey and chocolatey! My whole family would LOVE these muffins! The more chocolate, the better, and this looks so moist and delicious. Maybe I’ll make these during spring break and surprise the kiddos! Nothing’s better than a freshly organized pantry…except maybe chocolate muffins on a Monday. 😉 These look so yummy, Dawn! Love those big fluffy tops and that white chocolate/milk chocolate combo. Totally wishing I were eating one right now. Haha – agreed 😉 Thank you Tracy! I would totally share with ya! Thank you so much, Marissa! You’re so sweet! These muffins look incredible!! I love eating chocolate in the morning because it feels so decedent. I need to make these this week & will take your suggestion on freezing them too. I’ll be able to every morning for a couple of weeks! Yay me!! I ate pretty healthy over the weekend so I think I deserve a little Monday treat. And these would fit the bill! Talk about delicious! Three kinds of chocolate is three kinds of wonderful if you ask me :). Have a great week, girlie! I want to grab that fabulous muffin right off my screen Dawn! These look and sound amazing! LOVE all those chips! Thanks Mary Ann 🙂 Cheers to a lovely week! You definitely know how to put your best foot forward on a Monday, chocolate style! I love the ring to ‘triple chocolate’ – it holds such a promise for enjoyment:) Have a wonderful week, Dawn! Hehehe 😉 Thanks Milena! You too! Me either 😉 Thanks Jennifer! Wish I could send ya some! These muffins look amazing, Dawn! I’m not usually a chocolate in the morning kinda guy, but I will gladly put this one aside and scarf it down for lunch. I bet you could toast these lightly for an awesome ooey, gooey dessert creation. Add a scoop of vanilla ice cream maybe? Oh yeah, that needs to happen! And I totally agree with you about organizing the pantry…it’s probably about time for me to do that again here. Cheers to Monday, my friend! Sounds like a plan to me 😉 Love the idea of toasting….get that chocolate all melty! And ice-cream? Love the way you think, my friend!